Carey Price is used to dealing with pressure. The league’s best goalie plays in one of the hottest markets in the world, and he manages to always keep himself cool, calm and collected. Habs fans have a deep and passionate love for their team, and it’s easy to imagine how they feel about the man who has helped make their team competitive (almost singlehandedly) over the last few years. Though the 29-year-old is generally soft-spoken, here are three things that he has taught Habs fans over the last nine years. Everyone makes mistakes, right? Of course, professional athletes are really good at sports, but they may not be as good at other things. Price, for example, wasn’t necessarily good at keeping an eye on his two dogs, Motty and Duke a few years ago. The two labs escaped the Price residence in May of 2014, which led their concerned owner to send out a tweet. Luckily, Price has a large social media following, and his dogs were rapidly returned home. Price rewarded the landscaper that returned his dogs with a signed goalie stick. The goalie proved that though he doesn’t make many mistakes on the ice, he’s as prone as anyone to minor blunders off it. Price has a lot to gloat about; the former Vezina, Hart, Jennings and Ted Lindsay award winner has a log of impressive stats throughout his career, has successfully represented his country on multiple occasions, and has been deemed the world’s best goalie by some. Despite this, he manages to stay extremely humble and low-key. After being drafted 5th overall in 2005, Price was quoted as saying “I wasn’t expecting to go this high, but I’ll take it.” This is just one example of the goaltender’s overwhelming modesty. If you didn’t know him, and you met him on the street, you likely wouldn’t know that he’s a world-renowned athlete that makes over $6 million annually. This is a refreshing change from what the public sees from many professional athletes, who tend to be outrageous and arrogant. Price teaches us that modesty, though a simple quality, is one that is greatly appreciated by everyone. He always insists that his success is reflective of his teammates’ efforts, though Habs fans know that this isn’t always the case. This is one of the many reasons that he serves as an excellent role model for young athletes and young people everywhere. Price’s most famous quote came during a period when he was being heavily scrutinized early on in his career. He proceeded to tell reporters to “relax and just chill out” as his critics were naming him “one of the Habs’ biggest first-round busts of the modern era.” In fact, the goaltender didn’t have it easy early on in his tenure with the Canadiens’ organization. From the moment he was drafted, well-known hockey analyst Pierre McGuire said that the team didn’t need Price, and that selecting him 5th overall was a mistake. Time has (thankfully) proven McGuire wrong. In retrospect, Price may have had the right idea all along. For young players, especially goaltenders, the development and adjustment period to the NHL takes a long time. Once the B.C.-native was able to get his footing in the league, he quickly became known as one of the top young goaltenders in the world. As it turns out, Price’s “Chill Out” motto still represents him today. He is known around the league as one of the calmest goalies, whether he’s making saves or playing the puck. This not only gives his team a sense of security, it also makes everything that he does look deceptively easy. Habs players know that they can mess up from time to time because they have a stellar calming presence backing them up when need be. Ironically, Price’s value was on full display last season, when he missed all but 12 of the Habs’ games. The clear drop-off that the team suffered after their star goaltender went down was a true testament to how much he truly means to the organization. 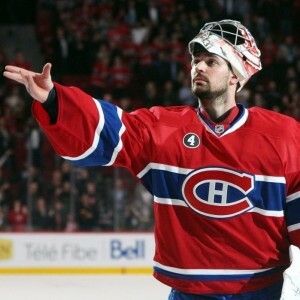 Luckily for Habs fans, Price is now back and healthy. So… I guess we can all just chill out. Athletes are very influential in their communities, as many young kids look up to them as heroes and role models. Price shows qualities that are very valuable to young athletes everywhere. As the Montreal saying goes, “In Price We Trust.” Whether it’s stopping pucks or being a good role model to young fans, we should keep our trust in the world’s best goalie… unless we need a dog sitter.